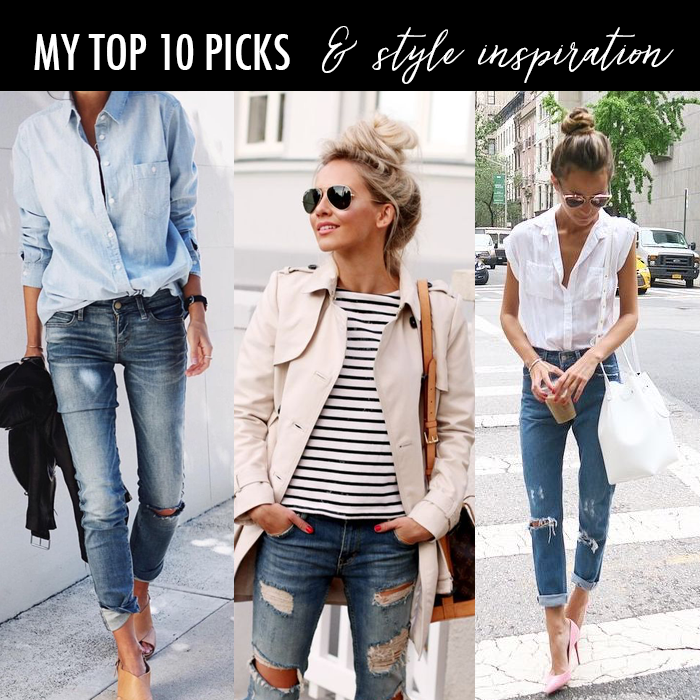 Some Pinterest style inspiration in casual denim. I love red and white stripes and this top is under $25. It also comes in traditional blue/white stripes, too. This linen striped off the shoulder top would be perfect for a hot summer day. These are the cutest striped shorts with a little ruffle detail at the top. This ruffle striped dress with the fun shoulder details would be a perfect casual summer dress. This striped romper is only $18. This striped flare jersey dress is only $10. It also comes in several colors and prints. This wrap dress is a perfect casual dress that is under $30. This ruffle hem linen blend top is only $18. These popular backless loafers are under $25. These espadrilles are only $13. In case you missed it, I shared 10 more top picks yesterday. And, on Friday, I shared my Friday Five most popular items and top five spring sweaters. these looks are perfection and I love the amazing blouses! Great inspiration!